The English summer weather is unpredictable to say the least. As I’m writing this, we’ve have torrential rain, glorious sunshine, and a lot of cloud cover over the space of just 7 days. It’s no surprise that the English folk react so crazily when the cloud breaks and we finally get to see a bit of the sun. When the sun comes out to play where I live the smell of BBQ’s begins to fill the air. And I must admit my family are no different. The beauty of a BBQ is that you can cook almost anything on it. This summer I’ve already shown you sizzling summer prawns, char grilled tuna, as well as barbequed courgette and bulgur wheat salad. This particular weekend however we didn’t have any special food in. The sun had come as a bit of a shock. The weather man had been saying for days we should expect the hottest weekend yet, but Saturday came and went and it remained overcast though a little warmer than usual. With the clouds overhead we assumed there was no point getting the BBQ out, but by Sunday afternoon the sun was shining brightly and it was time for me to raid the cupboards! We’d got chicken breasts in the fridge that we intended to use later in the week so this was where my inspiration started. 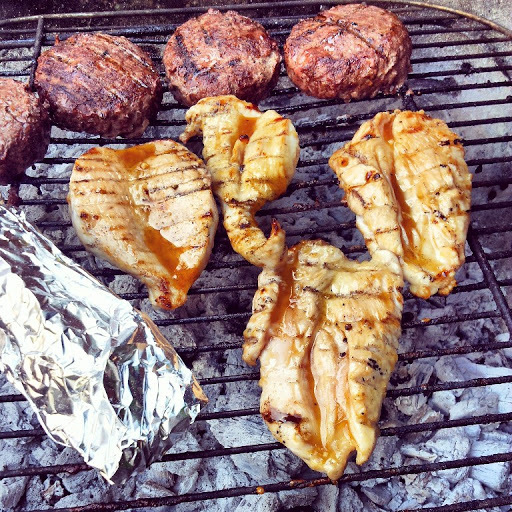 I butterflied the breast, making the surface area larger and the fillet thinner so it would cook quicker on the BBQ. I didn’t just want grilled chicken for dinner though. I wanted to jazz it up a bit! Out of the cupboard came mustard, honey, Worcestershire sauce, red wine vinegar, pepper and garlic – and so my honey and mustard glazed chicken was born! The key to success with this recipe is to use a brush to keep glazing the chicken as it cooks. This ensures you get a nice thick, sticky layer of the honey sauce. It also makes sure that the meat stays really moist. You end up with a sweet sticky outside, crispy char grilled edges and a moist meat below. Don’t be fooled by thinking this glaze can only be used on chicken. It also works really well on pork and turkey sausages! It is extremely versatile, and the same principle of glazing and turning the meat should be used regardless of whether you are glazing a piece of chicken or a sausage. Another great thing about this recipe is that you can use whatever type of honey you like, and any type of mustard. Since first making the glaze we have tried it with English, American and French mustard as well as smooth and grainy. Each gives a slightly different flavour but it still tastes delicious! If you don’t like too much heat coming from the mustard simply add a little less than the recipe states. 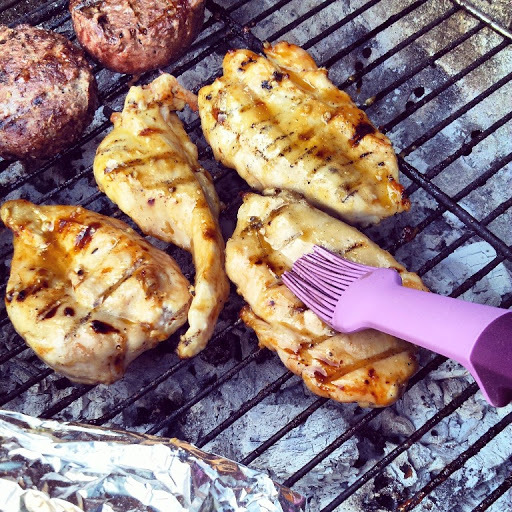 These honey and mustard glazed chicken breasts are perfect for throwing on the BBQ this summer! Cut a slit into the chicken breasts lengthways, being careful not to slice all the way through, so it opens out like a butterfly and place onto a plate. 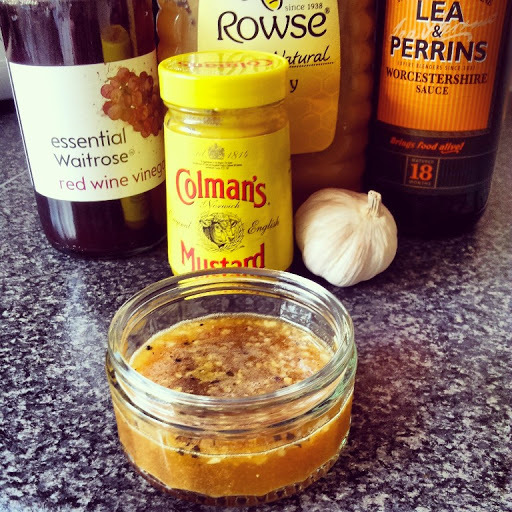 In a separate bowl, mix together the honey, vinegar, mustard and Worcestershire sauce. Crush a clove of garlic into the sticky sauce and mix together thoroughly. At this stage check to see if you want it sweeter (add more honey), more sour (add more vinegar), or hotter (add more mustard). Finally season with the black pepper. Brush a little of the glaze over each side of the chicken breasts and leave for at least 30 mins if possible. Transfer the chicken breasts straight onto a medium BBQ grill. Brush their tops with a little more of the glaze and allow to cook for a few mins. Keep turning the chicken every couple of minutes and adding more glaze to the breast until all of the glaze has been used up and the chicken is cooked through. You will probably need to do this every 3 mins for at least 15mins. Try to avoid cooking the chicken on too high a heat. The trick here is to cook the chicken slow and long getting a thick sticky glaze and moist chicken. 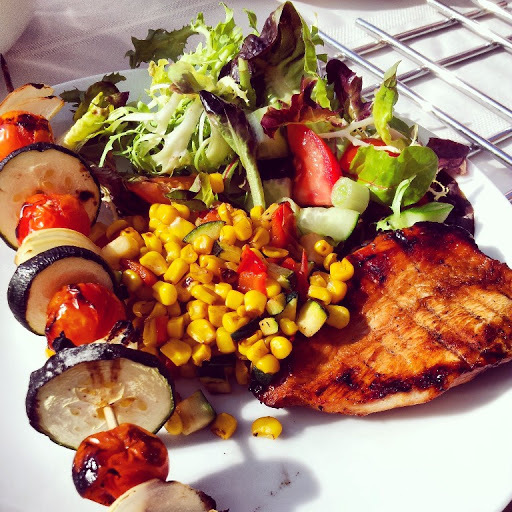 Serve straight off the BBQ with salad!